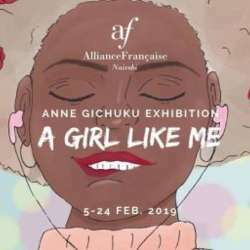 Anne Gichuku is a self-taught digital artist who with the help of friends and good old YouTube continues to grow her art. She won in the ‘Digital Art’ category at the inaugural Sondeka Awards Protected content by Creatives Garage. Anne describes her style as funky and eclectic. She likes bold colours and bold themes and keeps her influences culturally relevant. She dedicates her first exhibition to girls like her.